This holiday cottage has modern furniture and a lot of natural light. In the living room there is a high-beamed ceiling, big panoramic windows and access to a terrace and a big garden where you can listen to the sound of the sea and enjoy the sea view. The cottage has much natural light, and the biggest room is divided into a living area with TV and sofa group and a kitchen/dining area where you will also find the alcove. There is also a mezzanine overlooking the living room, a really nice place for the children. The house is surrounded by a big terrace, great place for total relaxation. Juelsminde is not far away, and one of the loveliest beaches of the area is only approx. 150 m away. Juelsminde is charming with a nice port area and many different activities. 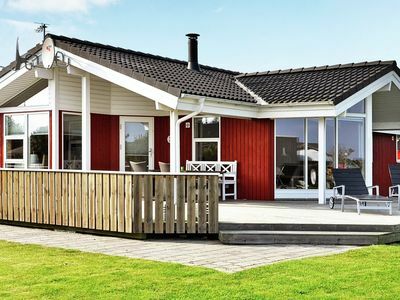 This cottage has a central location as to visiting many interesting tourist attractions in Jutland.